Crows make it look as if they have the world by the tail. When the dark river of them flies over to the nightly roost, they look powerful and untouchable. But that anonymous crowd, like all crowds, is made up of many individuals, — each with their own challenges, and their own story. This is story of the special bond between just two of those many crows — Marvin and Mavis. They first appeared in my garden around the time we lost George Brokenbeak. George’s mate, Mabel, stayed in the neighbourhood, but moved over a block, leaving my yard with a “vacancy for crows” sign on it. Marvin and Mavis had already been hanging around, so they were quick to move in and become fixtures. It seemed to me that they were a young couple, just starting out together. Every time I look outside I scan the sky for them. Most of the time, when I can see them, they’re together. If they’re not, one of them is making that “I’m over here. Where are you?” call to check in. Like most crow couples, their thoughts turned to nest building last spring. They took on the task with gusto, scouring every tree for just the “right” twigs. They made one “decoy” nest first and then settled on the real nest site in April. Marvin watches over the nest — which is nestled in the crook of one of the poplars in the lower right side of the picture. They worked so hard. They’d be there when the sun went down, forgoing the nightly trip to the roost to guard the nest and its contents, and they’d be back at it at dawn. Weeks went by and the trees leafed out, making it harder for me to see what was going on up there. One day though, I could tell something had gone wrong. Mavis left the nest and kept staring at it in confusion. Shortly after, I found their fledgling at the foot of the poplars. It had fallen from the nest and didn’t survive. They grieved their loss for many days, spending a lot of time just sitting in the trees near the nest, as if hoping the baby would reappear. Marvin spent a lot of time comforting Mavis, who seemed to have forgotten how to look after herself. Gradually they picked up the pieces and went back to their pre-nesting pursuits — going to the roost at night and guarding their territory by day. The summer was hot, dry and smokey from nearby forest fires, so just keeping cool and hydrated was a challenge. And then came the Great Moult of 2018. I have never seen our local crows in such a bedraggled state … and for such a long time. It seemed to start in early August and go on well into October. Mavis, at one point, had lost so many neck feathers, she looked partially decapitated. Marvin lost all his nostril feathers. They looked objectively terrible, but Marvin and Mavis didn’t seem to care. They may, for all I know, have giggled a little at the sight of each other, but their devotion remained unwavering. The new gleaming feathers did eventually come in, of course, and by late October they were their well groomed selves again. Which brings us to their latest challenge. In December I noticed a small growth on Mavis’s left foot. It’s avian pox, a virus that can spread and cause disability or death. Luckily, in her case, it seems to be not too serious and isn’t spreading. I make sure to put out extra nutritious food for her to keep her immune system in tip top shape. Marvin seems to know she needs all the help she can get and he seems quite happy to let her shove him out of the way to get her share of food. Their nest from last year is still tucked into the poplars, currently blanketed with snow. I hope that, once spring finally arrives, they’ll start checking out the neighbourhood for new real estate options and give the nest building another try. I’m pretty sure that Mavis will not expect roses this Valentine’s Day. It’s unlikely that they’ll be making reservations at a fancy dumpster. But they watch out for one another, they comfort each other in hard times, they keep each other warm in the cold, and they refrain from laughing at each other when they look like avian zombies — and, really, isn’t that better than chocolates in heart-shaped boxes? But a love song is always nice. Here, Marvin sings one, accompanied by our neighbour’s furnace sounds. My mother had a storehouse of wonderful sayings — one for every occasion, really. I’m reminded of both sayings every time I go outside at this time of year and see the state of the local crows. They always look bedraggled at this stage of the molting season, but the seemingly endless, long, hot summer seems to be making them even more tattered and grumpy-looking than usual. Feathers do not last forever, and after a year of hard service, the crows’ feathers begin to lose their glossy blue-black patina and become dull, with muted shades of sepia and grey. Luckily they have the ability to grow a new set of spanking new ones, but this metamorphosis comes at a cost. The process takes a lot of energy, which is why it’s usually timed for a period of relatively low corvid activity — after nesting and before migration (for those who head to warmer climes for winter). They need rest and good nutrition to grow the new feather cloak and hormonal changes associated with the process can make them feel out of sorts. This summer, with no rain to speak of in months, it must be especially gruelling. Food sources, and even water, are harder to come by than usual. I’ve been putting out a couple of bowls of water in my neighbourhood for Eric and Clara and the harried parents of the Firehall Triplets. I feel especially sorry for the molting crows with young ones, as they have to find food for extra mouths — and deal with the loud and constant appeals for food. Although they continue to try their luck at getting the parents to feed them, the fledglings are, by now, capable of doing some of their own foraging. The photo above was taken just this morning. The parent crow ignored that gaping pink beak and flew off with most of the peanuts I’d left. There were a couple left in the grass, and junior eventually got the hint and picked them up himself. Warning: This is a risky vantage point from which to take a photo of a baby (or any) crow. This is Eric, described by my husband as “the James Bond of crows” for his usually sleek unruffled feathers, and manner. As you can see, even Eric the Suave is looking rather ragged and disgruntled these days. Eric and Clara this morning. Only 8am and it’s hot already! Mabel can be found every morning just down the alley from Eric and Clara. Here she is, her faded feathers looking almost as colourful as the towels on the washing line behind her. My new pal has conveniently marked him- or herself with some paint around the neck, aiding in instant identification. It’s already fainter now and I guess the little paint mishap will be a distant memory when the new feathers come in. So, when you slip on your new back-to-school or back-to-work outfit, spare a thought for the poor crows who have to grow their own. It’s an arduous process, and I’m sure they’ll be mightily proud and relieved when their fall wardrobe finally comes in. Crow calendars now available online, or at the studio sale. We spent our Earth Day morning mounting a small neighbourhood search for George. From late summer to spring, George and Mabel come by our garden several times a day without fail. Then, one day each spring, they just seem to disappear. They don’t come to the house. They don’t greet me on my dog walks. I’ve noticed this happen for a couple of years and I assume that they are off doing top secret nesting work somewhere. A fellow George-watcher in the neighbourhood contacted me on Instagram yesterday to see if I’d seen him lately. She mentioned that she’d seen Mabel and their baby from last year at her end of the block. It worried me a bit that Mabel was around, but not George. Since the two are usually pretty inseparable, that seemed strange. This morning, my neighbour contacted me with the news that she’d seen George — several blocks away from where he usually hangs out. She included a silhouette photo of him on a lamp stand with the distinctive broken beak profile. This morning’s dog walk naturally took us on an exploratory expedition to this distant intersection in search of George. It seemed a little odd that he’d be so far away, but how many broken-beaked crows could there be in one neighbourhood? Geordie and Nina, fellow George seekers. As soon as we got to the corner in question, there he was. But wait a minute. This crow had a broken beak, just like George, but showed no sign of recognizing us. George usually zooms low all down the street to make a dramatic landing right beside me. This crow just continued his diligent turf-turning project on someone’s lawn (looking for chafer beetle grubs.) No interest in us whatsoever. Although he looked pretty identical to George, I knew it couldn’t be him. It made me realize two things. One: this sort of beak injury can’t be that rare after all. Two: crows look pretty identical to our undiscriminating human eyes. We have to use all the clues available to us — behaviour, location, which other crows they’re hanging out with, as well as little physical differences, to figure out who’s who. I figure it’s good exercise for the aging brain. Corvid Sudoko. I gave our new acquaintance a few peanuts, wished him well, and headed back to our street. As we got to the area where George and family usually gather, I saw what looked like George Junior. No sign of dad anywhere. Sigh. Then, like Batman dramatically arriving at a crime in progress, all of a sudden there he was! I think it was only because I was approaching his still-dependant offspring that he broke his cover to come and greet us. Peanuts were served. Virtual champagne was quaffed. So, now I’m back to my original theory, which is that George is occupied on some high security nest-related project and won’t be visiting, or swooping down regularly until that job is completed. Leaving me more time for my other worry project, Eric and Clara. Their nest is at the other end of the block, high up in the poplars. My concerns for them are, first: the poplar leaves are taking so long to come out that the nest is very visible to predators. It’s too high up for racoons, but just the right height for eagles, hawks and ravens. Eric and Clara’s nest is about 50 feet up there. The leaves are slowly, slowly providing camouflage. Which brings to me to my second and latest worry. If the babies do hatch successfully, how are they going to get to the ground safely. Baby crows often leave the nest before they can really fly. They hop around, do a bit of clumsy gliding, but real flying skill usually takes a couple of weeks to develop. So, what happens when you’re born in a high rise?? Once you start getting attached to wild birds, there really is no end to the list of things to worry about! I’ll be having my annual pre-Mother’s Day studio sale in a couple of weeks. If you’re in the Vancouver area, come on by and you can find out the latest news first hand. 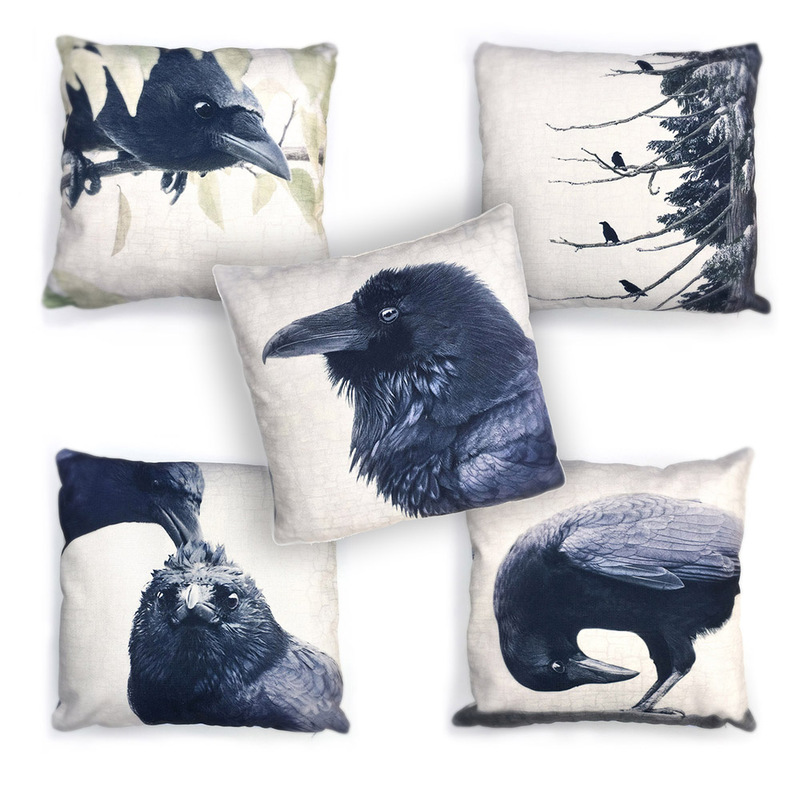 It was just like a door-crasher sale for crows, with home furnishings 50% off. Like a gang of bargain bin foragers, they created an explosion of tugging, flapping, snapping, inspecting and discarding. Reject twigs littered the sidewalk. In spite of the massive effort involved in finally getting a stick free, the crows would often cast a critical look at their prize and dump it. Perhaps they decided it was going to mess up the feng shui, or didn’t quite match the colour scheme — whatever — it wasn’t up to snuff so time to head back into find the “right” one. Even if a twig was worth flying off with, it would often be taken to a rooftop for some further DIY modification before being deemed nest-worthy. These photos are of Eric and Clara. I know it’s them because of where they’re building their nest. That half block has been “theirs” for as long as I’ve been watching them — at least four years. Eric finally flies off with a “perfect” twig. Eric and Clara’s nest, way up in the poplars. Because it’s been such a delayed spring here in Vancouver, crows are building their nests before the trees are leafed out enough to camouflage them. I can actually watch Eric and Clara working on the nest from my living room window at the moment. I only hope the local bald eagles and racoons aren’t also making notes! There was a definite joie de vivre in the air last Friday. Not only were the blossoms out (three weeks late) but it was also dry and sunny for the whole day. The blossoms were still there the next day, but the weather took a severe U-turn. There was very little twig collecting going on in the pouring rain. Trying to shake a twig loose from the soaking trees would have resulted in near drowning. And the wind! I think this juvenile crow’s look spoke for many of us when the rain started up again. Last year, after nesting season was over, I found this fallen crow’s nest. I brought it home to photograph its architectural features — a perfect embodiment of urban and nature. The main form was constructed from sturdy twigs, grass and moss, then reinforced with human detritus — old zap straps and twine. A bit of packing fluff for a luxurious finishing touch. Sometimes I wonder if there’s a crow memo circulating, directing slightly invalided birds to my place. There’s George Brokenbeak and also Hop-Along Hank. Hank walks with a limp because of a problem with his right foot that he’s had for as long as I’ve known him. Flying is no problem for him, but I can spot him on a roof top from quite a distance because of his distinctive stance, favouring the sore foot. That and his slightly hooked beak. Hank and Vera have been around since last spring. I wrote about them in an earlier blog, Here’s Hank, charting their failed effort at parenthood last year. I have a feeling that Hank is one of Eric’s offspring. Eric has seemingly ceded our backyard territory to Hank, in favour of a superior nesting spot in the tall poplars at the end of the street. Hank and Vera paying an early morning visit. You can see Hank’s slightly deformed foot on the far right. Now Hank and Vera and George and Mabel vie for my attentions. The four of them often sit together peaceably on the wires in the alley, but as soon as there are peanuts, it’s game on. The two pairs will never cooperate and share the food. Much ferocious cawing and occasional dive bombing ensue if I put nuts out when both couples are nearby. We seem to have worked out a more or less harmonious system where Hank and Vera come first thing in the morning. George and Mabel take the later shift, coming later in the morning , and sometimes in the afternoon too, for a last minute snack before the nightly journey to the Still Creek roost. Hank (left) and Vera (right) vociferously stake out their claim to the peanuts. Most of the time, Hank doesn’t seem too bothered by his foot problem, but when the weather is cold and wet, I sometimes see him standing forlornly on one leg. Another one of Hank’s characteristics is that he seems to like to yawn. I don’t know if crows actually do yawn, but he often opens his beak very wide without any sound coming out — so it looks very much like a yawn. Hank’s limping gait gives him a rather model-like pose. Auditioning for a part in Zoolander 3? So, this is Hank, as I know him. I’m sure Vera could tell some tales too! And I’ll be writing another Vera update soon. And, for those of you wondering about Eric — he’s still fine. I just saw him in the leafless poplar trees, swaying gently in the wind, from my dining room window.